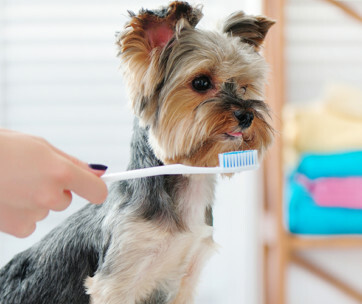 Making sure that your mutt stays well-groomed is one of your most important responsibilities as a dog owner. And there are certainly plenty of products available to help you do this. But if your dog is suffering from a skin condition like hot spots, inflammation, and red rashes, you will need specific products to treat it. These products are designed to treat the symptoms and provide your pup with some relief from itching and irritation. To give you a hand in making up your mind, here are some of the best medicated shampoos currently available. First on the list, we have this shampoo which has a strong antiseptic effect, protecting your pooch’s skin from irritation and moisture-loss. This yeast shampoo for dogs contains chlorhexidine as the main antiseptic ingredient, which is well-known for tackling the yeast and fungal species associated with dandruff and canine eczema. It also contains Phytosphingosine salicyloyl, which has an antiseborrheic effect. As well as killing certain types of microorganisms on your dog’s skin, this shampoo will also provide a great deal of nourishment, reducing the problems that your hound is having including skin inflammation, itching, and general irritation. This medicated dog shampoo is specifically formulated to deal with a broad spectrum of issues including bacteria, fungus, yeast, ringworm, and pyoderma. Both antifungal and antibacterial, the shampoo is designed to work gently on your dog’s skin, while still offering a deodorizing effect at the same time. 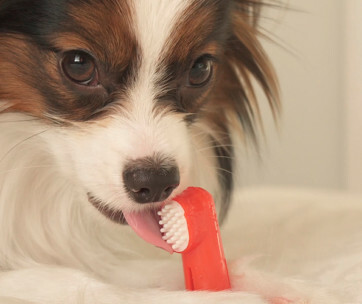 Instead of smelling musty, your pooch will have a cucumber melon aroma instead! This veterinary-strength product is made in the USA in a lab which has been federally regulated and inspected. If you are not fully satisfied, you always have the option of returning the bottle to claim a full refund. Made with coal tar, salicylic acid, and micronized sulfer, this shampoo is specially formulated to treat the skin scaling caused by seborrhea, as well as relieving a host of parasitic infections. Also included are colloidal oatmeal and allantoin for hydration and healing. Offering antiparasitic and antiseborrheic effects, it can help with unpleasant symptoms of skin conditions such as rashes, bald spots, and waxy skin. Dogs are well-known for their sensitive skin, so the pH levels have been carefully balanced to not cause undue irritation. Plus, it can also be used in conjunction with other topical skin treatments. If you are looking for a medicated pet shampoo which contains natural ingredients, this one from Paws & Pals is a great choice. Made with vegan and organic principles, the shampoo is designed to have a number of positive effects including reducing skin inflammation, cleansing and nourishing, and healing and regenerating. Some of the conditions which it is designed to help include hot spots, dry and flaky skin, and allergies. Since it is a soapless formula, you don’t have to worry about being so careful during your dog’s bath time as it will not inflame or irritate your dog’s nose or eyes. Suitable for dogs, cats, and horses, this medicated shampoo has antiseptic and antifungal properties. Relieving fungal and bacterial skin infections including pet acne and ringworm, it also helps to heal skin infections, cuts, scrapes and bug bites. The shampoo has a drying effect on areas of the body which tend to accumulate yeast and bacteria such as the skin folds, underarm, and groin regions. Made in the USA, it is independently lab tested to provide assurances of its effectiveness and purity. A gentle and soap-free product, DermaPet benzoyl dog shampoo is suitable for treatment of a wide range of different skin conditions including acne, greasy skin, skin fold infections, and hot spots. The formula is created using an all-natural base combined with sulfur and salicylic acid. As well as offering a moisturizing effect, it will leave your dog smelling of a natural, herbal aroma. Infectious molecules tend to get caught up in dog’s hair follicles, but this shampoo helps to clear them out. Available in two different sizes depending on the dimensions of your dog and how much treatment you need to give them, this medicated dog shampoo is specially designed to reduce flaking and itching skin. 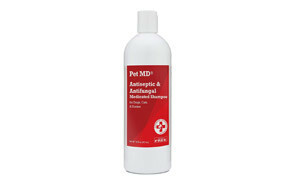 Unlike other medicated pet shampoos, this one is gentle enough to be used on a regular basis. And if you do, it will leave your pooch smelling great and with a soft and luscious coat. As well as stopping itching and flaking, it also offers a deep cleaning and deodorizing effect. 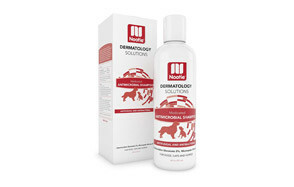 If your dog is suffering from demodectic mange, seborrhea dermatitis, or canine acne, this medicated shampoo can help. Opening and flushing out your hound’s hair follicles are two of the positive effects which it offers. The moisturizers contained within the formula promote the hydration of skin and coats. If your dog has an especially greasy coat, this helps to degrease it. As it features a stronger formula than some of the others, you should be especially careful not to get any of it in your pet’s eyes. If your dog has especially sensitive skin, this hypoallergenic dog shampoo can help with their itching and scratching without causing further irritation. Unlike other stronger shampoos, you can comfortably use it as often as you like without drying out your dog’s skin. Also, it doesn’t affect other topical treatments. It also offers some extra smoothness to coats which have become dry and brittle. The core natural ingredients include aloe vera and vitamin E.
This long-lasting dog shampoo is especially concentrated, meaning that you only need a small amount to work up an impressive lather. It has antibacterial and antifungal properties for dogs, which make it perfect for tackling conditions like ringworm, which can lead to further, more serious issues if it is left untreated. It also helps temporary issues like big bites, stopping them becoming more serious. After you have bathed your dog in it, they will be left with a pleasant scent, which is bound to be a welcome relief in your household! Medicated dog shampoos tend to have a set of core features which many of them offer. In the following section, we will outline some of these, so you have a better idea of exactly what you should be looking out for. We will go into more detail about the different types of medicated dog shampoos later in the blog post, but you should specifically choose one which is suitable for the condition(s) that your dog is suffering from. As a follow up from the previous point, the ingredients in a dog shampoo will go a long way towards explaining the effects that it has. Some contain chemicals, whereas others are more naturally based. Do some research online or consult with your vet to find out more about the effects of the different ingredients. Beyond the main effect that you bought the shampoo for – whether this is hot spots, ringworm etc – you will want to know what other positive effects it has on your dog. Some of the main advantages include cleaning and softening your dog’s coat and leaving them with a pleasant aroma. Some shampoos are strong enough to deal with specific health issues, whereas others are gentle and meant for longer-term use. Again, everything comes back to why your dog needs the shampoo in the first place, as well as the sensitivity of their skin, and whether or not they suffer from allergies. There are plenty of specific benefits which pooches suffering from skin conditions can expect to receive from medicated shampoos. Here is a selection of some of the main advantages. While regular shampoos are made for general grooming, medicated dog shampoos tend to be manufactured to treat specific conditions. Whether this is the treatment of dandruff or the removal of bacteria, you need to choose the type of shampoo which is made for the condition that your dog is suffering from. Scroll down the page to find out more about the different types of medicated dog shampoo out there. Many environmental allergies can be treated with medicated dog shampoos for allergies. The right shampoo is designed to remove the allergic triggers from skin contact, as well as reducing the itching and inflammation. 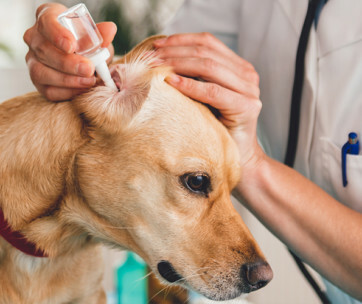 If you are unsure whether or not your pet is suffering from allergies, look for symptoms including excessive itchiness, hair loss, red and inflamed skin, and chronic ear infections. If you need further confirmation, take your pooch into the vet to obtain this. Conditions such as ringworm usually include medicated dog shampoo as one of the treatment methods. As well as aiding recovery, they will offer symptom relief. Bacterial and yeast infections are often a secondary condition, so the primary one needs to be cleared as well. 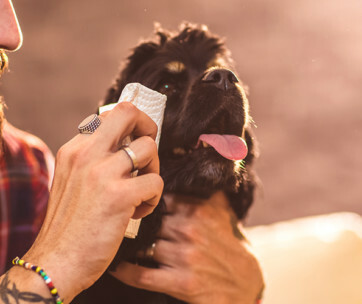 Dogs with a history of infection are more likely to have skin which is easily irritated, so the antibacterial dog shampoo should be mild and non-drying. Ingredients such as oatmeal and tea tree oil are two highly popular choices. The most common parasites which affect dogs are ticks and fleas. Using special flea and tick prevention products is one way of stopping them from being an issue, but if they have already made it into your home, bathing them will provide some instant relief. You should choose a medicated shampoo which is not going to interfere with your dog’s other flea and tick treatments. Follow the instructions of both closely to ensure they work properly. The more broad-ranging cleansing shampoos are designed to deal with issues such as hotspots or dry and scaly skin. Often, the effects are immediate and can provide a great deal of relief to your suffering hound. The possible causes of dry skin are numerous including too much bathing, dietary imbalance, and low humidity. If you plan on using this shampoo on a more general or regular basis, you should choose one which is gentle on the skin. There are other options to treat your dog’s skin conditions, but things like oral tablets or injectables can affect areas other than the problem site. And the side effects are likely to be more significant than topical treatments. Dog shampoos tend to only impact the outer surface of the skin, so you are unlikely to get effects that impact other areas. But always remember that you need to be especially careful in not getting the shampoo in your dog’s eyes or anywhere else that it is likely to cause harm. While medicated dog shampoos are generally safe due to the topical nature of their application, it is worth knowing about the potential side effects which they could have. This way, you can learn to spot them in your dog, so you know early whether or not to discontinue treatment. Your dog having an allergic reaction is always a potential problem, and they are possible if your pet has a hypersensitivity to any of the ingredients within the shampoo. Some signs of an allergic reaction include itching and skin redness. Another possible side effect which could impact your mutt is shedding. This is more common in the highly concentrated shampoos, so the problem may be that you are using too much or bathing your dog too regularly. Itching and redness are two of the most common signs that the medicated shampoo is irritating your dog’s skin. Often, this is a result of tar or coal-based shampoos, or those containing substances like benzoyl or salicylic acid. Another side effect is your dog suffering from a negative side effect is excessive skin dryness. Usually, this is caused by benzoyl or salicylic acid-based shampoos. The strength of many of these types of shampoo means that it can be irritating to your pooch’s eyes. And since dogs don’t know to close their eyes when they are being bathed, you need to take special care. You could try using some eye lubricant ointment as a way of protecting their peepers. 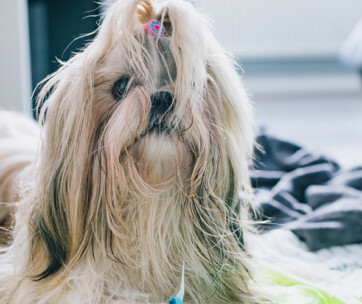 There are several different types of medicated dog shampoos which you need to know more about before making your decision. This choice will be based on the specific condition that your dog is suffering from and which one is designed for maximum effectiveness and relief. Designed to treat the stubborn dandruff, reddish skin, and scaly patches which accompany the common skin condition seborrheic dermatitis, antiseborrheic shampoo is stronger than ordinary products which simply won’t do the job properly. The exact causes are unknown, but the condition is likely to be a result of fungus and an unusual reaction in your dog’s immune system. The shampoos are designed to remove the microbial action causing the skin disturbances, as well as having a degreasing effect. Another common type of dog shampoo, the antibacterial variety is designed to tackle pathogenic organisms which can accumulate on your dog’s skin. When your dog’s skin breaks, there is also the chance that normal bacteria will turn pathogenic. These shampoos usually contain ingredients such as benzoyl peroxide and ethyl lactate to tackle the undesired bacterial activity on your dog. Next up, you have the antifungal dog shampoos. While fungus is typically present on your dog’s skin, the main problem comes if it becomes pathogenic. Imidazoles tend to be an effective option when it comes to the removal and prevention of infections. The most common antipruritic shampoos are oatmeal-based. The granules are designed to absorb the allergens and mediate the associated itching. They can help to provide your dog with some relief when they are scratching all the time. This variety is more generic, designed to remove the dirt and debris which can clog up your dog’s pores. Some of the conditions which these shampoos work to treat include canine acne and seborrhea. Medicated shampoos don’t contain soap, so they are formulated to be safe and gentle on your dog’s skin. They also offer a moisturizing effect which helps with skin that has become scaly and dry. A: Medicated dog shampoos are designed for pooches who are suffering from skin or coat conditions. The ingredients can vary between chemical and natural substances. There is also a host of different varieties including antiseborrheic, antifungal, antibacterial, and antipruritic. Sometimes, these different types overlap. The variety you choose should depend on the specific condition which is causing the problem. Some of the issues which these shampoos can help include allergies, fungal and bacterial infections, parasitic problems, and general dry skin. Sometimes, they will treat the conditions directly, whereas other times, they will help to clear up the symptoms such as dry and itchy skin. There are also gentler shampoos which are suitable for use on a more regular basis on dogs with sensitive skin. If you are unsure whether or not this is the right course of action for your dog, you should consult with your vet for more information on the subject. Many dog skin conditions also need additional types of treatment until they are properly under control. A: Bathing your dog using medicated shampoo is straightforward and should be something that you can do by yourself. First, you will need a bathtub. Ideally, some sort of access to an attachment showerhead will help. You will obviously need your chosen medicated shampoo and some towels as well. The damaged skin should start to heal within a few weeks. However, in more serious cases, it may take longer. Giving your pets baths on a regular basis is a good way of checking up on how the condition is doing and whether it is getting better or worse. Now, let’s get into the method of bathing your dog using the medicated shampoo. If you have some sterile eye lubricant ointment, you can use this on the surface of your pet’s eyes to prevent irritation. Prepare the water temperature. It should be lukewarm and comfortable, as your pet’s skin is likely to be sensitive to water which is too hot or cold. Now, you can place your dog in the bathtub to start soaking them with the water. Start with the top of their head and start working your way down their entire body. Gravity will naturally pull the water down to their skin. Using one hand, you can direct the jet, while using the other to direct it deep into their coat. Obviously, this will take longer with shaggier animals. Soaking helps to soften and loosen dirt and debris. The next stage involves lathering the shampoo into your pet’s coat. With medicated shampoos, you often need to leave it to sit for a period of 10 minutes or more but check the instructions on the packaging for further clarification. Make sure to time it properly so it has the maximum effectiveness. 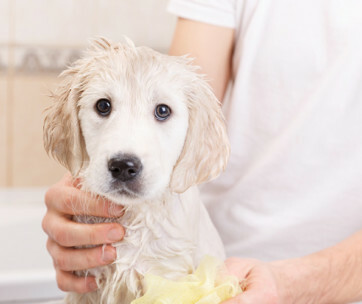 Follow this up by rinsing your dog thoroughly, making sure that all soap is removed. This may take as long or longer than the actual shampooing. Finally, you should towel dry their entire coat. Avoid blow drying as there may be some residue that remains in contact with your pet’s skin which could be deactivated by heat. A: Dog shampoo does expire, which is why it is essential to read the label before using it. Expired products will not have the same positive impacts on your dog’s skin. Indeed, they could lead to a further infection. The expiration date is usually made clear on the bottom or shoulder of the bottle. If you are unsure, it is better to be safe by investing in a new product. Of all the medicated dog shampoos which we have discussed in this blog post, our number one choice is this one from Douxo. Formulated with an antiseptic foaming solution, it is specially designed to protect the skin from irritations and moisture-loss. Chlorhexidine is one of the main ingredients, and this is suitable for a range of skin conditions which range from the mild to the serious. Many people have testified that this is a product which really works, and we have ranked it top of our list of best medicated dog shampoos.